One clear trend in interior architecture and design is the growing interest in wood. Swedish coniferous trees in particular appear to be back in favor. 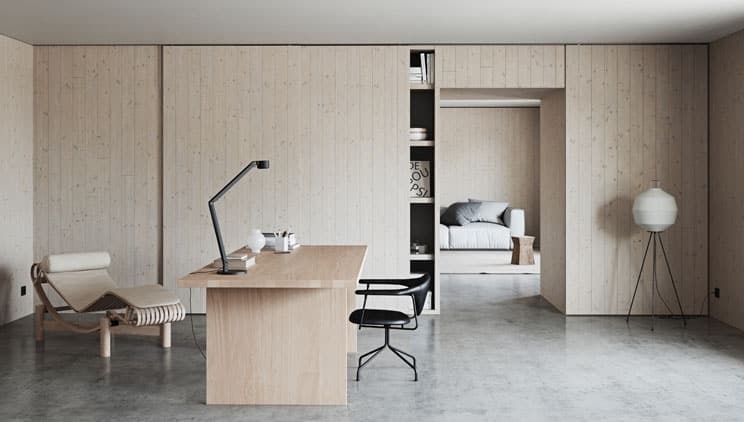 At this year’s Stockholm Furniture & Light Fair, which will be held February 5-9, the fair’s exhibitions will feature a lot of pine and spruce. A growing number of designers and architects are turning to wood more frequently for their interiors and furniture. This is noticeable at Stockholm Furniture & Light Fair, where pine and, to some extent, spruce are well-represented. The installation designed by Chinese architecture and design firm Neri&Hu – this year’s Guest of Honour– is all pine. The serpentine-shaped village was built using a total of six kilometers of pine from the forests of Värmland in Sweden. The Design Bar, which was designed by Norwegian design studio Anderssen & Voll, also features predominantly pine and spruce. “Wood is a fantastic material. We chose primarily pine for our installation for a number of reasons: it grows here in the Nordic region, it is a living material and it smells good. It also has a natural warmth and is easy to work with. We want to create a soothing oasis that enables intimate meetings between guests, and this material makes this possible. To enhance the feel and impression of pine, we also placed two pine trees in the courtyard with the goal of enhancing the appreciation and respect for the material. These two beautiful trees were already going to be harvested, we would like to add,” explains Torbjørn Anderssen. Industry organization Swedish Wood is partnering with Stockholm Furniture & Light for these exhibitions and contributes with knowledge and in selection of material. At Swedish Wood, the wood trend is very clear: Swedish coniferous trees are growing very quickly in popularity. Curiosity and demand, from not only producers but also interior architects and designers are increasing. “From our perspective, it is both inspiring and a lot of fun to see how the world’s leading designers use and refine these types of wood. Both pine and spruce are versatile and esthetically pleasing materials that can be given many different expressions to create beautiful and inspirational environments. The exhibitions at the Fair are clear evidence of this,” says Björn Nordin from Swedish Wood.